Nowadays, it is generally accepted that meditation is good for us. We might not be able to ground this belief in our own scientific understanding nor even (especially if we’re beginning) in our experience, but we tend to hold it. Yet as people who take our practice seriously it can be worth having a basic knowledge of the benefits and the underlying science. Not only will we give ourselves an excellent incentive to keep practicing, we’ll also be better able to notice the positive changes in our life, as and when they happen. If you’ve ever asked, “Does meditation work?” this article will try to answer that question. Increases positive emotions and lessens negative ones like depression and anxiety. It also improves our ability to emotionally self-regulate (e.g calm yourself down or overcome nervousness). Increases brain volume in areas associated with a subjective experience of happiness and concentration (actual physical changes – often referred to as “brain plasticity”). It engages the parasympathetic nervous system. The ensuing physiological changes are experienced as relaxation. Again, this is especially useful for counteracting the long-term negative effects of stress. A commonly-cited starting point for the now-burgeoning scientific exploration of meditation is Herbert Benson’s 1975 book The Relaxation Response. Prompted by his research into TM (Transcendental Meditation), Benson outlines a range of bodily functions that are positively influenced during and after meditation (the “relaxation response” is comprised of these changes in blood pressure, heart rate, metabolism etc.). It’s this “relaxation response” that provides perhaps the most salient aspect of our understanding of why meditation is so beneficial. Marilyn Mitchell M.D. says that “The Relaxation Response is a helpful way to turn off fight or flight response and bring the body back to pre-stress levels.”1 When our day-to-day experience of emotional strain can often be chronic we need a way to bring ourselves back down and stay there. So the real benefit of meditation, especially as it relates to those managing a hectic life, lies in its ability to engage our relaxation response. All the ensuing physical and emotional benefits are largely a result of this return to “normality.” It allows us to counteract the negative effects of consistent exposure to perceived threats. Even if you are a relatively calm person the long-term benefits of regularly engaging your parasympathetic nervous system (responsible for orchestrating the positive bodily changes) can be immense. So what other knowledge do we have? Much of the scientific research is done using technology that tracks changes in different areas of the brain. These changes are measured using fMRI and EEG scanning, both during active meditation sessions and in groups of long-term meditators. What is Functional Magnetic Resonance Imaging (fMRI) and Electroencephalography (EEG)? fMRI is a technology that measures blood-flow and oxygenation in the brain during a particular activity: when a section of the brain is more active it requires more oxygen and so the blood supply to it is increased. This allows scientists to create “activation maps” showing the relative activity of different parts of the brain. This is why researchers are able to say, for example, that the area associated with feelings of compassion and loving-kindness is more active during meditation. EEG (electroencephalography) works on a similar principle but by measuring electrical activity with the use of sensors attached to the head. Terms like “gamma” or “theta” waves refer to measurable patterns of neural activity (they’re not actual energy waves) that are indicative of different brain (and ensuing emotional) states. Amygdala: This is responsible for emotions of fear and your fight-or-flight response. The amygdala is the part of the brain that initiates a response to a perceived stressor. It is one of the most commonly-studied areas by meditation researchers. Insula: Responsible for your subjective experience of bodily sensations including emotions. Lateral Prefrontal Cortex: Responsible for your rational analysis of stimuli and events. Medial Prefrontal Cortex: Responsible for processing information related to your sense of self. One thing that has been noticed is that the left prefrontal cortex (just behind the left forehead) is especially active during meditation. This area of the brain is associated with positive emotional experiences. 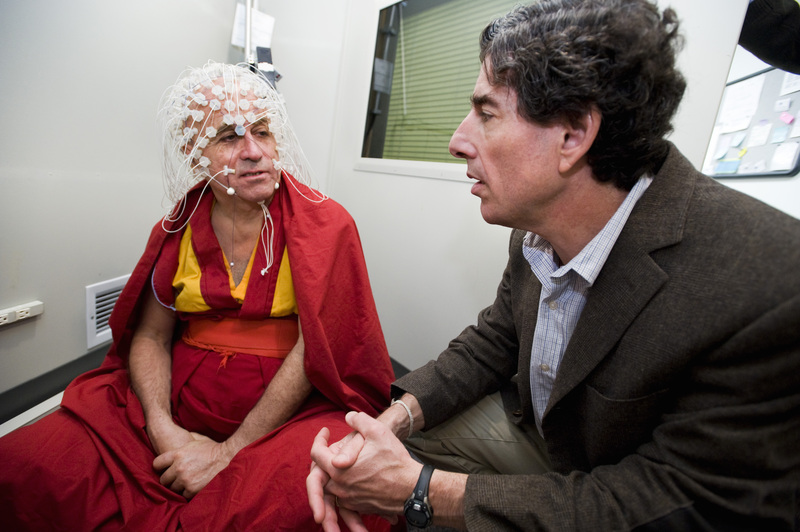 In a well-documented study, neuroscientist Richard Davidson studied the gamma wave activity of ten highly trained Buddhist monks, using an equal number of inexperienced volunteers as a control group. He found that the monks had significantly higher gamma-wave activity, indicating more prefrontal cortex activity, both during and outside of meditation time. We can talk about the scientific motivations to meditate for hours, but it’s in its felt benefits that it really makes its power known. Even after meditating for only a few days, you will notice positive emotional changes. This was something I found that has been confirmed by others. There is a model given by Mark Thornton in his book Meditation in A New York Minute that I found especially helpful. Yet we can include a possible fourth dimension of experience, that of our inner spaciousness and silence. The process of meditation is, in many ways, an opening up to the action of this sublime aspect of ourselves. A deepening of the experience of compassion, wisdom, and silence that flows from it and a willingness to allow their expression in our life. I do understand that it’s easy to be averse to this kind of abstract language. Bear in mind that it’s only a model. It’s designed to help you make sense of the positive emotional change that comes about through meditation. The Mystical Brain: A great little documentary that explores some of the boundary-pushing work by scientists like Richard Davidson. The picture above of Buddhist monk Matthieu Ricard is taken from it. Recommended Book: The Buddha’s Brain. Recommended Book: The Relaxation Response. For a deeper look at some of the contemporary research in this area you might also want to read The Mind’s Own Physician. If you enjoyed this article you might also like our “best 0f” selection of meditation books. Our meditation music selection and simple grounding meditation might also pique your interest. In a real rush? You need a two-minute bodyscan. We also have a series of very short guided meditations over on our Youtube channel that you may enjoy.